We’ve found great deals at 24 hotels! 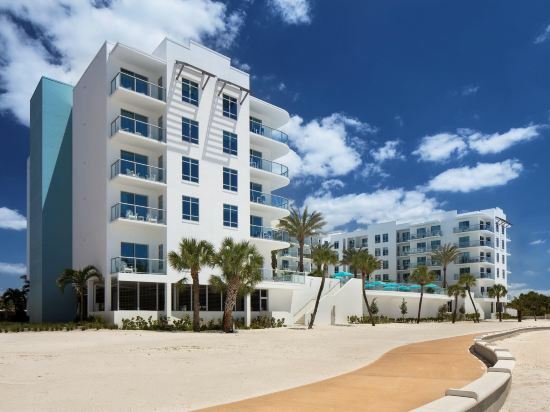 The Bilmar Beach Resort, a Florida Gulf Coast resort located in beautiful Treasure Island, Florida, offers unparalleled sophistication and elegance that you won’t find in ordinary hotels. The Bilmar is a Treasure Island, Florida resort that has been the undisputed favorite of families for years. The spacious guest accommodations and amenities that include two heated pools and a beach side fitness trail are all a part of what makes this oceanfront getaway unforgettable. When other hotels on Treasure Island simply will not do, make plans for a vacation as it was meant to be—at the Bilmar Beach Resort. Whether you’re a guest of the Bilmar Beach Resort or just looking for an authentic Floridian lunch or dinner spot, Sloppy Joe’s on the Beach Restaurant is the place for you! This unique beach front restaurant serves lunch and dinner daily, with fresh Key West-inspired seafood favorites. Entrees include the popular Macadamia Nut Crusted Grouper, Jumbo Lump Crab Cakes and the ever-popular Seafood Chowder. The outside patio of Bazzie’s Beach Bar overlooks pool and the Gulf, making it the perfect location for any time of day. Guests of the Bilmar enjoy sunrise breakfasts by the beach, relaxed lunches, extremely romantic dinners and evening cocktails. The live evening entertainment and the oceanfront atmosphere creates an ambiance that can only be described as casual and fun — just what visitors of Treasure Island love about the Bilmar. Offering stunning views of the ocean, this beachfront resort is situated on Treasure Island, seconds from endless recreational activities and offers friendly service complete with all the comforts of home. The Sunset Vista Beachfront Suites is surrounded by a variety of activities and area attractions. Guests can enjoy a casino boast cruise, experience parasailing or scuba diving. The hotel's knowledgeable staff can also help arrange area tours, excursions and even dinner reservations. Start the morning at the Sunset Suites with breakfast from the hotel's on-site restaurant, or take advantage of in-room fully-equipped kitchens. After a long day, relax by the pool or enjoy breathtaking views of the Gulf of Mexico from private balconies. Please note that rated are based on quadruple occupancy, additional person will be assessed an additional fee. There is only one car parking space permitted per suite. The on-site, Ocean Front Cafe & Lounge is open, for breakfast, lunch, light dinners, snacks and cocktails. 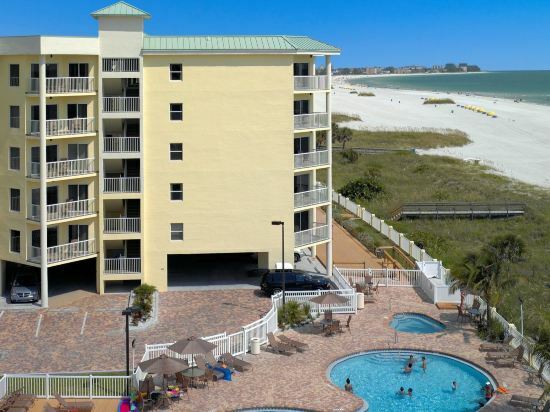 Located on Treasure Island Beach, this Florida resort offers an outdoor heated pool. Free WiFi is available. Guest can hire a boat 2 km away at Hubbard’s Marina. A partial beach view is featured in each every room. A 32-inch flat-screen cable TV, microwave, and refrigerator are also included in all rooms at Treasure Island Ocean Club. The reception is open 24 hours for added convenience and offers free coffee daily from 07:00 until 22:00. Free limited parking is provided on site at this Florida Treasure Island Ocean Club. The property is within 2 km of the shops and restaurants that line John's Pass Village and Boardwalk. Treasure Island Golf Tennis Recreation Center is 400 metres away. Treasure Bay Hotel & Marina features lush landscaping and a marina on Boca Ciega Bay. Guests can enjoy the outdoor pool, hot tub, and rooftop sun deck. A balcony or patio is found with each relaxing room of the Treasure Bay Hotel. A microwave, small refrigerator, and coffee machine are included as well as a flat-screen TV and free WiFi access. A fitness room is open to all guests. A business centre, laundry facilities, and vending machines are also provided. The beach is just 3 minutes' walk from the Hotel & Marina. John’s Pass Village is just 3 minutes' drive from the Florida hotel, and Treasure Bay Golf and Tennis is 1.8 km away. 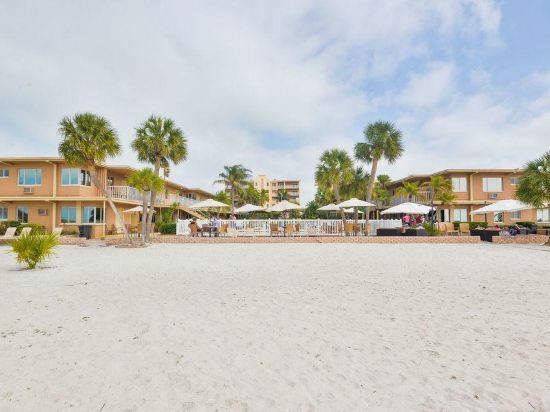 Located in St. Pete Beach, Treasure Island Beach Resort is surrounded by the white sandy beaches of the Gulf of Mexico. Guests can enjoy coastal decor, floor-to-ceiling windows, and free WiFi in the accommodations. The resort features a beachfront outdoor pool and sun terrace. The on-site signature restaurant, BRGR Kitchen + Bar, serves gourmet burgers, salads, and comfort-inspired dishes. A fitness centre and free private parking are also available at the Florida beach resort. Each suite has a dining area and a kitchenette with a refrigerator, stovetop, dishwasher, and microwave. A seating area, desk, and flat-screen TV are included, and each private bathroom boasts bathrobes and free toiletries. In the surroundings, John's Pass Village and Boardwalk is just 3 minutes' drive away. Boca Ciega Bay Aquatic Preserve is 7 km from the Treasure Island Resort, and Dolphin Landings Charter Boat Center is 6.5 km away. 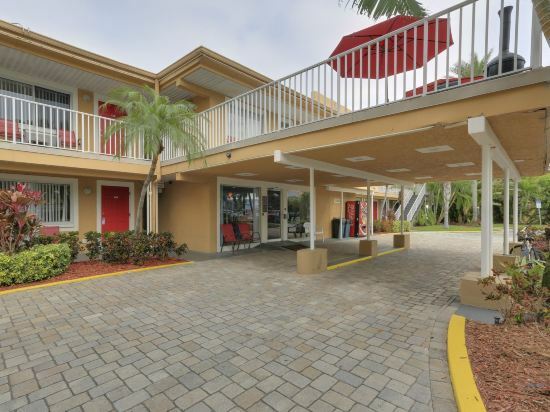 Located just steps from the Boca Ciega Bay and Gulf of Mexico on Treasure Island, this all-suite hotel features a 15-slip marina and outdoor pool. Its spacious accommodations offer a fully equipped kitchenette. 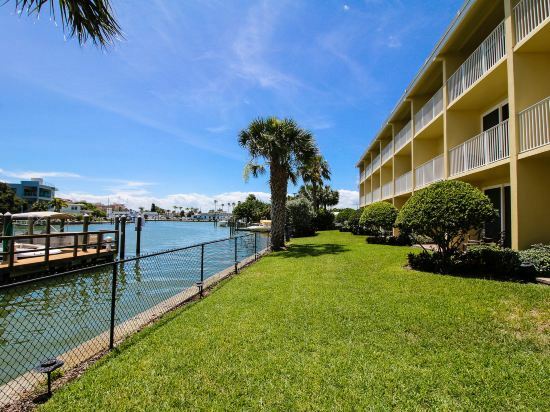 A flat-screen cable TV and free Wi-Fi are included in the contemporary suites at Bayside Inn and Marina. There is a dining area along with a seating area. Bay view suites are available. Guests can relax on the rooftop deck during their stay at Bayside Marina and Inn. They can also use the barbecue grills. St. Petersburg Municipal Beach is just a 2-minute walk from this hotel. Saint Petersburg-Clearwater International Airport is 15 miles away. Looking for hotels in Treasure Island? Trip.com is a great place to start. If you want to stay at the best hotel in Treasure Island, Trip.com is here to help! In Treasure Island, both areas with attractions and the city center are good places to stay. You can plan a one or two day trip to Treasure Island. Treasure Island does not have civilian airport. You can fly into a nearby city and come here using another method of transportation. Although there aren't any airports or train stations, visitors can come to the city via bus or other means of transportation. On Trip.com, there are 24 recommended hotels in Treasure Island. When looking for hotels in Treasure Island, there are likely good options at a nightly budget of just 132 USD. There are 9 three-star hotels in Treasure Island at an average price of 150 USD per night. There are 6 two-star hotels in Treasure Island at an average price of 89 USD per night. Unique local hotels in Treasure Island provide guests a unique and fresh feeling. If the comfort level of your trip is important, there are many choices in Treasure Island, such as hotels under the Residence Inn brand. Hotels under the Residence Inn brand are a good choice. 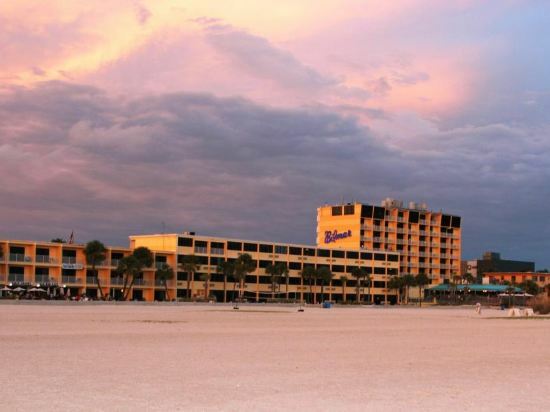 A popular hotel in Treasure Island, Treasure Island Beach Resort is also one of the highest rated. Many tourists also stay at The Bungalows. In the city center of Treasure Island, you'll have easy access to The Cigar Republic. The most famous attractions locally are Bucky Big Pirate of Treasure Island. With a developed commercial area, visitors can head to Tracey’s Treasures, Vine & Grind, Maykel Wood Carving Art Gallery for a great shopping experience. Treasure Island hotel information & deal: Check out room rates, photos, a map and reviews of hotels in Treasure Island and find the best deals on Treasure Island hotels. Trip.com offers big savings on online reservations for Treasure Island accommodation. Book Treasure Island vacation packages and Treasure Island tours with huge discounts on Trip.com!